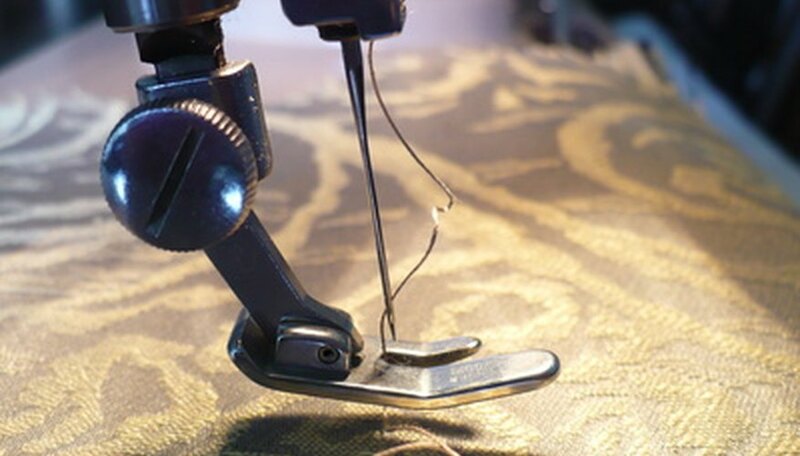 Operating a sewing machine for the first time can seem complicated, but it's really very easy. There are three things you will need to do before you are ready to sew: fill the bobbin, thread the machine and stitch. The Kenmore 12 Stitch machine is designed for the beginning sewer. Marketed exclusively through Sears, replacement parts for the Kenmore machines are available through Sears Customer Service. Place the spool of thread on the tall spindle on top of the sewing machine. Pull several feet of thread from the spool and wrap it around the thread guide over the take up lever. Poke the thread through one of the small holes on the bobbin. Place the bobbin on the short spindle on the right side of the machine. Slide the short bobbin to the right until it clicks. Loosen the center portion of the hand wheel by holding the outer wheel and turning the central portion toward you. Plug the electrical cord and the foot pedal into the right hand side of the machine. Place the foot pedal on the floor and plug the electrical cord into the socket. Grasp the tail of thread emerging from the top of the bobbin and slowly press the foot pedal. The bobbin spins and the thread winds. Stop the winding by lifting your foot off the pedal. Clip the thread between the spool and the bobbin. Tighten the hand wheel by rotating the central portion toward the back. Raise the needle to its highest position. Pull the sleeve extension off the base of the sewing machine to the left. Open the shuttle door. You will see a small handle folded neatly into the center of a circle. Pull out the bobbin handle and remove the bobbin case. Slide the bobbin into the case, leaving a 6-inch tail of thread. Slide the thread into the slot on the side of the bobbin case and under the metal tension plate. Holding the handle out from the case, place the bobbin case back in place. Pull 2 feet of thread from the spool. Slide the thread behind the thread guide at the top of the machine. Pull the thread down the front of the sewing machine and slide it under the tension dial making sure that the thread fits between the two metal tension plates. Pull the thread upwards until it raises the thread guide on the tension dial. Release the thread. Pull the thread upwards. Poke the end of the thread through the hole on the take up lever. Pull the thread back down the front of the machine sliding it into the two thread guides on the front and the single thread guide on the needle. Thread the needle from front to back. Slide the thread under the presser foot and over the feed dogs. The feed dogs are the small, toothed strips of metal that move the fabric forward. Pull several inches of thread behind the machine. Hold the thread from the needle in your hand. Slowly rotate the hand wheel until the needle moves down and back up to its highest point. The bobbin thread is wrapped around the needle thread. Slide the pair of scissors between the presser foot and the feed dogs to catch both threads. Pull both threads behind the needle. Place the scrap fabric between the presser foot and the feed dogs. Line the edge of the seam up with the lines on the machine. The throat plate, or metal plate under the needle, has lines that mark 3/8, 1/2 and 5/8 inch seams. Lower the presser foot with the lever directly behind the needle. On the right side of the machine is a dial that allows you to choose the type of stitch. Start with the straight stitch. On the right side of the machine, there is a second dial that allows you to chose the length of the stitch. Turn the hand wheel until the needle pierces the fabric. Slowly press on the foot pedal and make two or three stitches. Hold the lever on the side of the machine down and the machine goes backward. Make two or three backwards stitches and release the lever. The seam is now locked and the machine stitches forward again. Stitch the entire seam or line of stitching. Reverse a few stitches at the end of the seam by pressing the lever. Stop the machine with the needle in the highest position. Raise the presser foot and slide the fabric free of the machine. Snip the threads. Play with the different stitches available on the dial. Some are decorative, while others are useful for stitching different types of fabric. Keep your fingers away from the needle when sewing the seam.